Enterprises to Soil Hydraulic Characteristics. 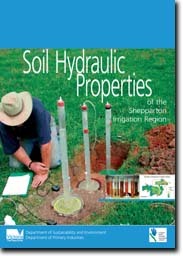 This project has focused on collecting information on soil hydraulic properties of major soils in the Shepparton Irrigation District. Such information provides a useful tool for facilitating land use changes consistent with the principles of water use efficiency and sustainability. Existing detailed soil maps were used as a reference. 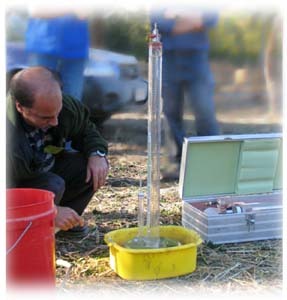 The study carried out measurements of hydraulic properties on 34 soil types at 79 sites - representing 75% of the Shepparton Irrigation region. 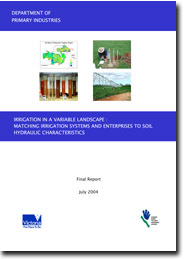 This new information on soil hydraulic properties adds significant value to existing soil maps and information, and will assist in land use planing, irrigation design, water management and irrigation related policy initiatives. 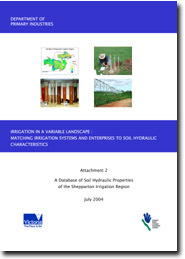 In addition, soil hydraulic property data will provide a knowledge link between irrigation management and impact on water tables and salinity, and between farm and catchment management. To view the information PDF requires the use of a PDF reader. This can be installed for free from the Adobe website (external link). 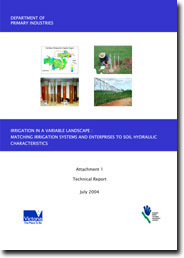 Matching irrigation systems and enterprises to soil hydraulic characteristics. © The State of Victoria, 1996 - . This page was last updated on .